Meet new people in USA! Meet new people in [city_name]! 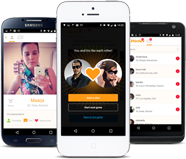 Everyone will find a date and new friends on Flirtic.com. Would you go to cinema with her? What’s your ideal date like? Take quizzes, play games, flirt and have fun. The best way to date is to be on Flirtic.com. Send out an invitation and enjoy a date. Flirtic.com is a new generation dating site. You will find your perfect partner without spending hours on browsing others' profile. Just answer a few simple questions in compatibility tests and our unique algorithm will find right people for you. There are 20% people in Europe and USA who marry after dating online. There are no social boundaries or age restrictions - online dating is for both young and old. Online dating is extremely efficient and easy comparing to traditional dating methods. Flirtic.com is a free dating site. You won't have to pay in order to find your perfect partner. On some dating sites you need premium membership to see profiles of other users while on Flirtic.com all main features will be free forever. You can get tests' results, go for a date or rate pictures for free. Flirtic.com is fanatic about your privacy: we never share your data with third parties. You are in control of data you publish on your profile. Everyone will find a date! Flirtic.com is used by hundreds of thousands men and women from all over the country. You can meet cool people from capital city or even small villages. Spend a minute to answer a few questions and find your perfect match nearby. You can instantly go for a date with people you like - go for romantic dinner in a fancy restaurant, see the latest movie in a cinema or even go for a romantic trip to Paris. We promise that on Flirtic.com everyone will find the perfect partner!